En historisk universitetsby, kulinarisk hovedstad og centrum for arkitektonisk skønhed, Bologna tilbyder ingen mangel på attraktioner - og denne zippy cykeltur gennem byen giver dig den perfekte mulighed for at udforske. Kom tæt på og personligt med seværdighederne, fra den travle Piazza Maggiore til Basilica di San Domenico og det moderne Manifattura delle Arti-distrikt. Som du går, høre om byens lange historie fra din guide. We rode with Francesco who was an excellent guide with a thorough knowledge of Bologna and Italian history. The bike tour was 2 hours and we were given all kinds of information about where to spend our time after the bike ride. The ride took us through all of the downtown sites and important sites. It was not a difficult ride at all and my wife and I felt very safe riding along the streets. Great tour around Bologna stopping at the sites to hear the history of the city. It lived up to our expectations. A good relaxing way to see and learn about the town. Our guide tour was really good. She took us through all of bologna's city centre and was very kind and informative. I would definitely recommend this tour to bologna visitors. 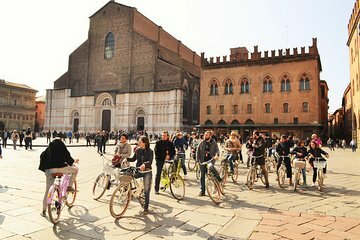 Biking in Bologna's city centre was an amazing experience! Thank you! Amazing bike tour! Amazing guide! Amazing city! One of our favorite spots in Italy and so ideally seen by bike! This tour was perfect to have a first view of Bologna after a long flight from the US. It promotes physical activity and generates energy. Linda is absolutely a great tour leader: Dynamic, easy to talk with, professional and knowledgeable. Apart from the hot weather, the bike ride was pleasant and the guide was well informed. Would recommend it to other tourist.